Below is another photo hastily taken in 2013 during a walking tour of Los Angeles’ Evergreen Cemetery. With only a few hours before I was due back at the airport I neglected to get quality shots of some of the tombstones, so for a better look at Biddy’s monument click here. Bridget “Biddy” Mason was born into slavery on August 15, 1818 on a Georgia plantation*. After being ripped away from her parents and sold to different plantation owners she worked in Georgia, Mississippi, and South Carolina. On John Smithson’s South Carolina plantation Biddy assisted in the household and learned about midwifery. When she was 18 Smithson “gifted” her to his cousin Robert Marion Smith as a wedding present. During her time with Robert and his wife in Mississippi Biddy’s reputation and experience as a midwife grew. She also gave birth to three children who were likely fathered by Robert Smith: Ellen, Ann, and Harriet. In 1847 after Smith converted to Mormonism he moved his family and slaves to Utah where there was an established Mormon settlement. Biddy is said to have walked behind Smith’s wagon train for most of the cross-country trek carrying one of her children and was responsible for assisting in the births of a number of babies born during those seven months. Robert Smith followed Brigham Young to San Bernardino, California and took his slaves with him. 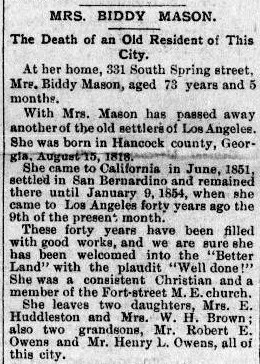 One of Biddy’s daughters had a suitor who informed Mason and possibly the other slaves that according to California law, any slave who came within its borders was considered a free person. Smith reacted to California’s anti-slavery stance by deciding to move everyone to Texas, where slavery was still legal. His plan was thwarted when the suitor’s father Robert Owens filed a petition against Smith for illegally keeping slaves. After a judge declared all of Smith’s slaves free Biddy chose the surname Mason and eventually moved into Robert Owen’s residence. She earned a living as a midwife and nurse who volunteered her services to people in need. 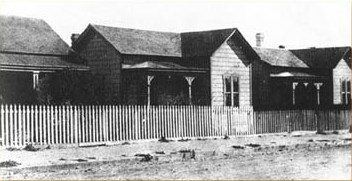 She saved money and ten years later became one of the first African American women to own property in Los Angeles.Through rental and commercial real estate investments Biddy became substantially wealthy and along with her son-in-law Charles Owens, she built the First African Methodist Episcopal Church. Biddy was known for giving freely to charities and helping with the those less fortunate and incarcerated populations. When she died at 73 in 1891 she was buried in an unmarked grave in Boyle Heights. Almost 100 years later a tombstone was erected during a ceremony attending by thousands of people. *Some sources claim Biddy was born in Mississippi. Next Next post: Murder or Death By Drunken Fall?